U.S. West Texas Intermediate crude futures were up 79 cents, or 1.3 percent, at $60.09 per barrel around 12:40 p.m. ET (1640 GMT). WTI earlier touched $60.73, its highest level since Nov. 12. 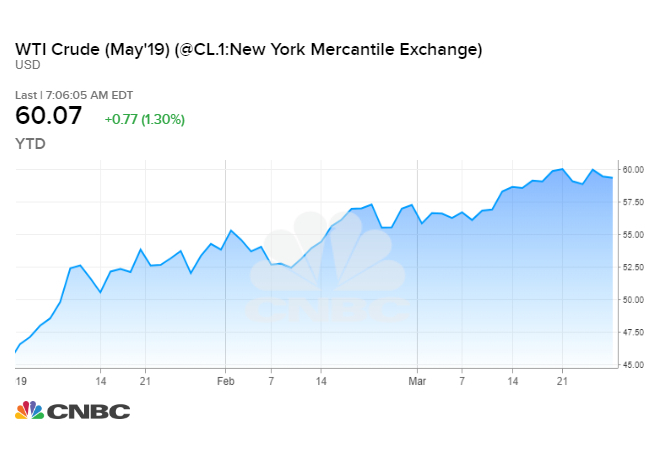 WTI futures were set to rise for a fourth straight week and were on track to rise 32 percent in the first three months of the year. International benchmark Brent crude futures rose 57 cents to $68.39 per barrel, after hitting a 2019 high at $68.89. Brent futures were set to rise 2 percent for the week and by 27 percent in the first quarter. Oil prices have been supported for much of 2019 by the efforts of OPEC and non-affiliated allies like Russia, together known as OPEC+. The alliance has pledged to withhold around 1.2 million barrels per day of supply this year to prop up markets. OPEC’s de-facto leader Saudi Arabia favors cuts for the full year while Russia, which only reluctantly joined the agreement, is seen to be less keen to keep holding back supply beyond September. “The biggest short-term risk to the oil market is likely to be driven by renewed stock market weakness,” said Saxo Bank’s Hansen.